ONE SG, LLC v. THE RESIDENCES AT 137 NORTH STREET CONDOMINIUMS, JASON DiFULVIO, ARIANNA P. MURPHY, JOSEPH A. BARNES, and SARAH-ANNE JOHNSON. This case involves two properties on North Street in Salem, both of which are improved with residential condominium buildings. Plaintiff is the owner of one condominium unit on property located at 133½ North Street (133½ North Street). Defendants are the owners and Trustees of the condominium located on adjacent property (137 North Street). In a three-count Amended Verified Complaint, Plaintiff claims an easement by necessity in its favor over 137 North Street for vehicular access to Plaintiff's parking spaces which are located at or near the common boundary between 133½ North Street and 137 North Street. [Note 1] Plaintiff also alleges Defendants, by refusing to grant it an easement, are in breach of contract, and seeks injunctive relief, ordering Defendants to permit Plaintiff's use of their driveway. Alternatively, Plaintiff alleges damages grounded in quantum meruit. A hearing on Plaintiff's motion for preliminary injunction was held March 1, 2018. The motion was denied, but Plaintiff was allowed to file an amended complaint to more accurately reflect the arguments raised at the hearing. [Note 2] Defendants moved to dismiss pursuant to Mass. R. Civ. P. 12(b)(6), on March 26, 2018, and a hearing was held April 27, 2018. For the reasons set forth below, Defendants' motion is ALLOWED, as this court finds no grounds presented by the Complaint which state a claim for the relief sought. In reviewing a motion to dismiss under Mass. R. Civ. P. 12(b)(6), for failure to state a claim, the court accepts as true the factual allegations of the complaint, as well as any favorable inferences which may reasonably be drawn therefrom. Ginther v. Comm'r of Insurance, 427 Mass. 319 , 322 (1998). The court may take into consideration documents integral to, referred to, or explicitly relied on in the complaint, attached or not, without converting the motion to a motion for summary judgment. Marram v. Kobrick Offshore Fund, Ltd., 442 Mass. 43 , 45 (2004). The factual allegations must plausibly suggest, and not merely be consistent with, an entitlement to relief. Iannocchino v. Ford Motor Co., 451 Mass. 623 , 636 (2008). Based on these standards, this court is persuaded that this case cannot survive Defendants' motion, as its theories for relief are not supported by facts Plaintiff put before the court. The court accepts as true the following facts, demonstrated by the Complaint, augmented by the documents referred to therein. Plaintiff and Defendants own partially abutting properties on North Street in Salem. Under the condominium documents for 133½ North Street, Plaintiff has the use of two parking spaces, both located in front of Plaintiff's Unit 1R. As shown on the Sketch, Plaintiff is unable to access its parking spaces due to the location of a wood fence erected adjacent to the parking spaces on a neighboring property owned by a third party not involved in this action. That property is shown on the Sketch as 135 North Street and it directly abuts Plaintiff's Property. Also as shown on the Sketch, all three properties, 133½, 135, and 137 North Street, have frontage on North Street. Plaintiff further alleges it took affirmative steps in anticipation of the grant of receiving an easement from Defendants, such as cutting down trees, removing tree stumps and clearing debris and trash, all of which would be necessary in order to move a car in and out of Plaintiff's parking spaces onto Defendants' driveway, to use it to access North Street. Plaintiff claims its property is "landlocked" and therefore it is entitled to an easement by necessity over 137 North Street. An easement by necessity is a type of implied easement, arising when a conveyance from a common grantor renders one parcel landlocked. Such an easement provides access over the parcel that is not landlocked, if the parties so intended. While "[t]he law does not give a right of way over the land of other persons to every owner of land who otherwise would have no means of access to it," Richards v. Attleboro Branch R. Co., 153 Mass. 120 , 122 (1891), the law will imply an easement where such implication is founded "upon the presumed intention of the parties to the deed, construed, as it must be, with reference to the circumstances under which it was made." Id. The party claiming an easement by necessity  here, Plaintiff  has the burden of establishing that the parties intended to create an easement that is not expressed in a deed. Mt. Holyoke Realty Corp. v. Holyoke Realty Corp., 284 Mass. 100 , 105 (1933). A presumption of easement by necessity arises upon a showing of the following elements: (1) unity of title; (2) severance of that unity by a conveyance; and (3) necessity arising from the severance, most often when a lot becomes landlocked. Kitras v. Town of Aquinnah, 474 Mass. 132 , 141 (2016). The necessity must have existed at the time of the division. See Viall v. Carpenter, 80 Mass. 126 (1859). Plaintiff's claim of an easement by necessity fails as a matter of law, as none of the elements of the creation of an easement by necessity are presented here. Plaintiff makes no allegation that 133½ and 137 North Street were ever held in common ownership. 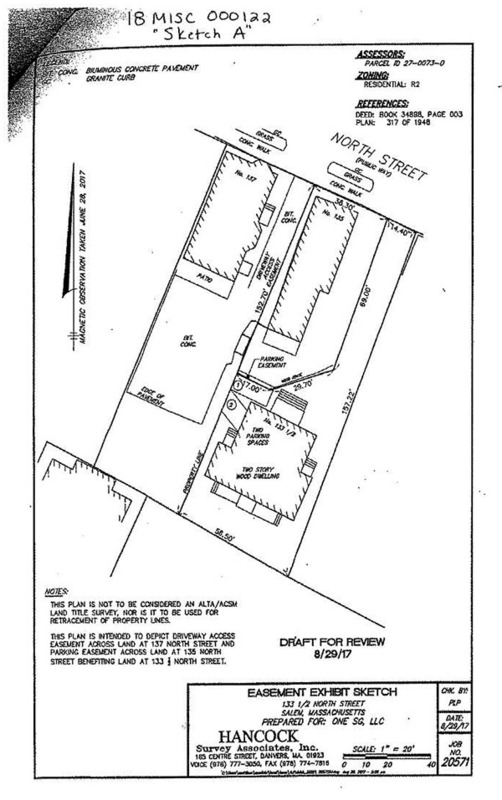 Despite Plaintiff's categorization of its property as landlocked, the sketch attached to its Complaint shows 133½ North Street has frontage on and access to North Street, a public way. Plaintiff's actual problem is that the property owner of 135 North Street (not a party to this action) has installed a fence on its property which interferes with the accessibility of Plaintiff's parking spaces where it has chosen to locate them, and it would be difficult for Plaintiff to relocate parking spaces elsewhere on its Property. Plaintiff's problem is not of Defendants' making. [Note 3] Plaintiff Failed to Plead The Existence of a Valid Contract Between it And Defendants. The claim for Quantum Meruit was likewise unsupported by allegations in the Complaint. Defendants' Motion to Dismiss pursuant to Mass. R. Civ. P. 12(b)(6), is ALLOWED. [Note 1] See sketch attached hereto as Sketch A. For ease of reference, the court refers to 133½ North Street as Plaintiff's Property, though Plaintiff owns only one unit (Unit 1R). Plaintiff was the developer of the 133½ North Street Condominiums. [Note 2] The Amended Verified Complaint, filed March 5, 2018, is hereafter referred to as "Complaint." [Note 3] The parties proffered at the hearing a plan entitled "Plan of Land Owned by Sebastian Cugno, Salem Mass., recorded with the Essex South Registry of Deeds in Book 360, at Page 565, as Plan 317 of 1948 (1948 Plan). This plan shows what is now 135 North Street and 133½ North Street as Lots "A" and "B" respectively, both owned by Mr. Cugno. As shown, both Lots have the same linear frontage on North Street shown on Sketch A, prepared in 2017. Defendants' property at 137 North Street is not shown on the 1948 Plan. [Note 4] The court notes that Defendants also argue Plaintiff, as one of the unit owners in a condominium, does not have standing to litigate issues affecting condominium common areas. In the Complaint, Plaintiff alleges it is "the developer and original land owner of all condominiums thereon, and retains authority to file this action." The court assumes, without deciding, that the allegation is correct for the purposes of this motion.